A little while ago I had the opportunity to tour McGill’s hazardous waste facility with chief waste disposal tecnician Ian Lorenz. A team of six at hazardous waste collects and manages bio-hazard and radioactive wastes, e-waste, chemical waste, and metal recyclates for the ENTIRE university community. In addition, many of them are on call 24 hours a day as an acting emergency hazardous cleanup team for the university. Between those two responsibilities, it’s amazing that they find time and effort to consider sustainability as well, including working with students on research projects, and implementing nuanced approaches to reducing and managing the waste campus produces. Their team often ends up problem solving and creatively coming up with solutions to campus waste issues that no one else is qualified to deal with. Their purvue seems to keep on expanding. 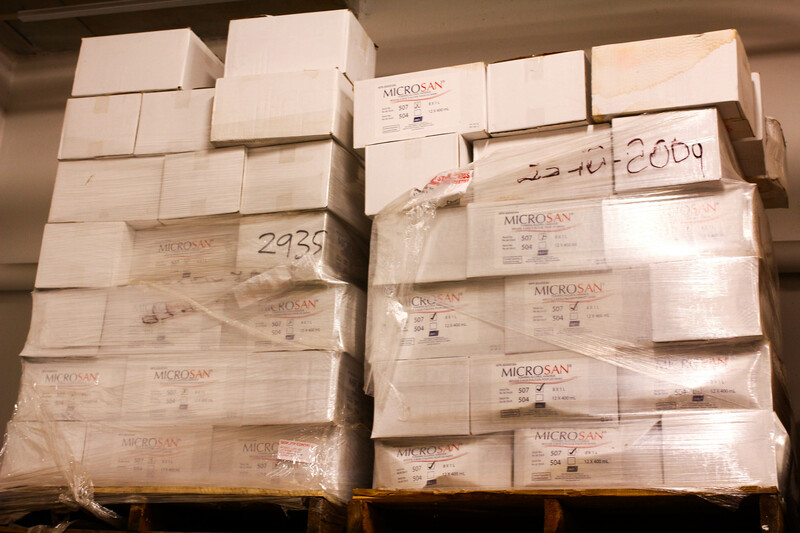 These are two crates-full of leftover hand sanitizer from the 2009 H1N1 scare at McGill. In a hasty reaction to what appeared to be a significant health risk for students, the university purchased a bit too much, and it didn’t go to use. 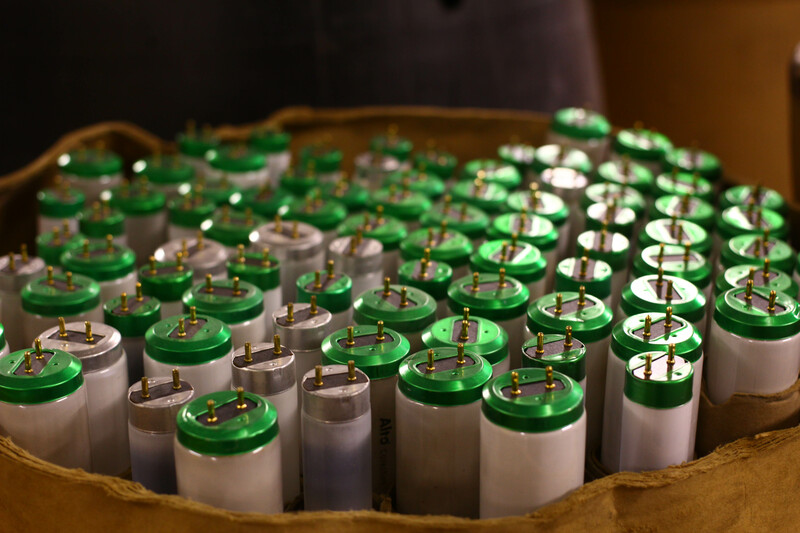 Over time members of hazardous waste have re-distributed it to sources like the School of Nursing, and continue to oversee the product getting re-purposed. 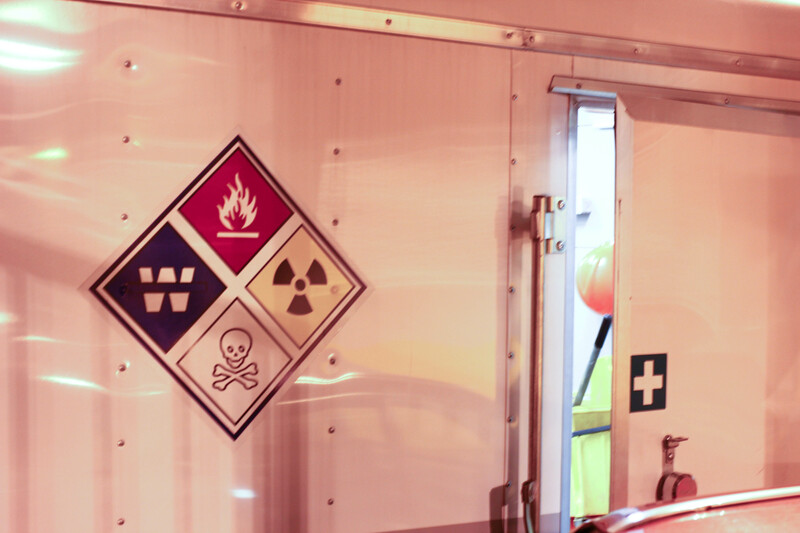 This is the side of the mobile HAZMAT response trailer. It’s packed to the brim with every conceivable tool necessary to deal with emergencies, be it radioactive liquid spills or hydrochloric acid leaks. 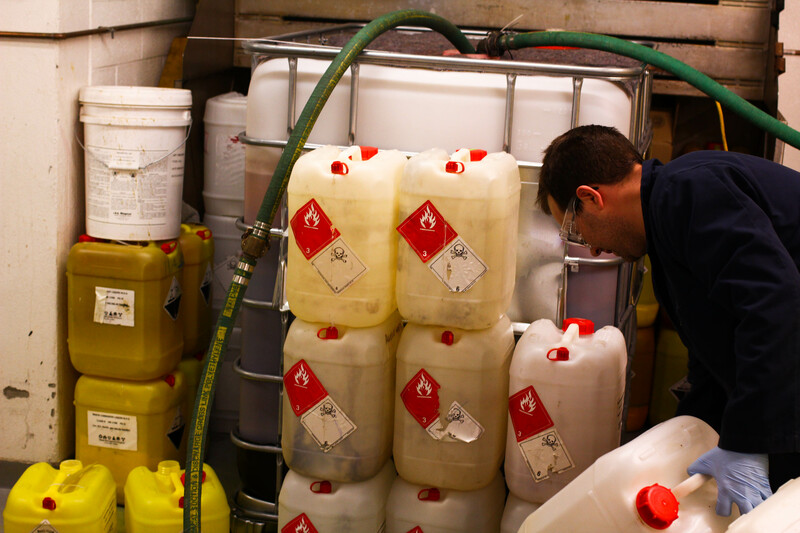 Jason Hull is the Hazardous Materials Specialist and works on the solvents and chemical waste collection and processing, processing and disposing of over 400L of chemical waste a week. All of the chemical processing rooms have ultra-violet and infrared sensitive cameras pointing from every angle in order to register the signature of any sparks or flames. Even something as subtle as the flash of a camera would trigger an extinguishing mechanism that douses the room in high pressure water blasts (300fps) from ceiling mounted water guns. They also collect and dispose of fluorescent lightbulbs that gives every building at McGill that characteristically dry and office-tinged light source.. This constitutes the disposal of upwards of 500-600 of them a week. That means McGill goes through over 100,000 a year. 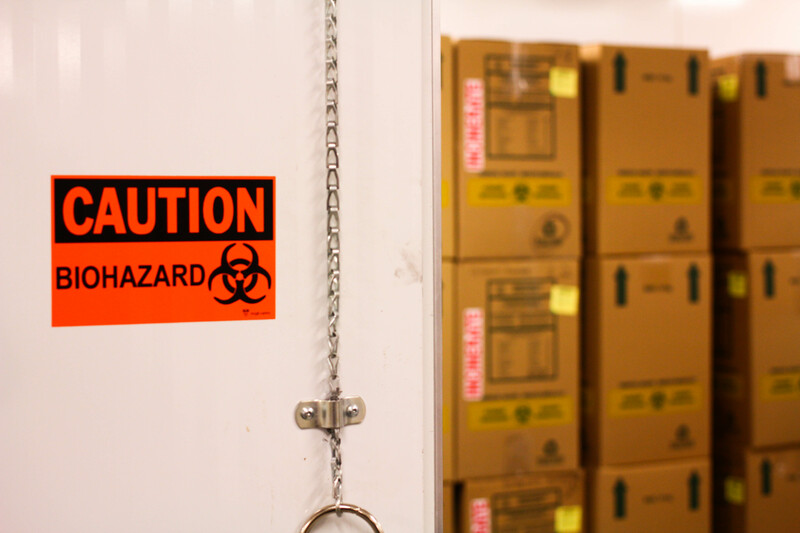 Hazardous Waste also collects and manages and disposes of bio-hazard waste produced in labs; everything from bacteria cultures to animal carcasses used in dissections. McGill outputs 120-160 10kg boxes every week. All the bio-waste in eastern Canada gets shipped to a mega-incinerator in New Brunswick, and so the overall carbon footprint of packaging and shipping can be pretty massive. As a result, the Hazardous Waste Department are looking into the possibility of installing a “vapor-sterilization” system that could render up to 80% of the collected bio-waste harmless, and thus could be sent to a normal trash dump just outside of Montreal. That could constitute massive savings in cost AND carbon. If you enjoyed this preliminary look behind the scenes at the Hazardous Waste Department, stay tuned for more content coming out of the McGill Waste Project. 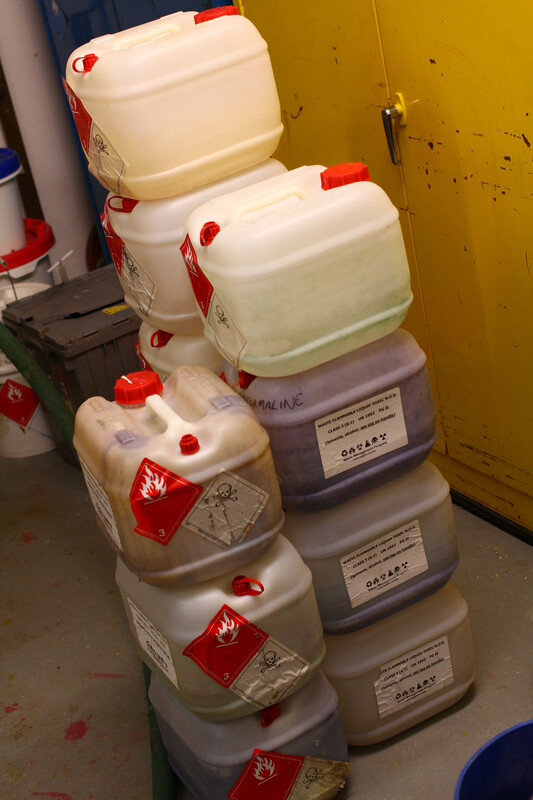 To learn more about what the hazardous waste department does, visit http://www.mcgill.ca/hwm/. Looking for students to be involved with MWP! ASR Opportunities for Winter 2014!